One British musician Mat McNerney seems to be quite a world traveler. Having lived in Holland, Norway and of course native UK, he is also a participant in the bands in France, and has been nominated for a Norwegian Emmy. It took, however, a move to Finland to get Mat to adopt the persona of Captain Kvohst and drift away from the more extreme metal genres with Hexvessel. This relatively young collective, including Mat ‘Kvohst’ McNerney himself, also counts as many as seven Finnish lads and maidens from Tampere area and is the farthest thing there is from extreme metal. No Holier Temple, debatably, is not metal at all, instead focusing on things spiritual and occult, presenting them through the prism of psychedelic neofolk. And psychedelic this album is to the core, for if the term wasn’t invented before, it surely would have to be after No Holier Temple saw the light (or is it the dusk) of day. Many of the compositions of this opus have plenty of fresh acoustic folk interwoven in it, but none of these could have been written without a healthy dose of hallucinogenic mushrooms (and that is, of course, a pure speculation on my part). Setting things forth with a meditative spoken Heaven and Earth Magic, Hexvessel with its first few tracks totally floored me touching the territory I have reserved for Lake of Tears and their Forever Autumn masterpiece. Woods to Conjure, Wilderness Is, and A Letter in Birch Bark unveil beautiful melodies, presented with unbelievable clarity and special instruments touches, trumpet in Woods to Conjure, cold piano droplets over acoustic guitars in Wilderness Is and accordion soloing over tremoloed acoustic harp in A Letter in Birch Bark. Cold and clean, as spring mountain creek, and coupled with sleepy male vocals these songs are bound to clear the air and brighten the mood. It is obvious, however, that going all nature-oriented and ambient is not the purpose of Hexvessel on No Holier Temple. From His Portal Tomb onwards, the songs grow in length, complexity, presenting multi-part structure, but most importantly shift to the more somber, dark-replacing-light magical feeling. His Portal Tomb is not placed somewhere in the woods on a cool fall day anymore. Instead it is fuzzy hazy throbbing doom rock, reminiscent of Jesus Christ Superstar in places with its predominant verse riff and moaning vocals. 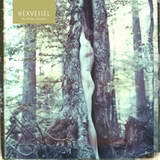 With a few respites afterwards (the medieval masquerade square yells Are You Coniferous), Hexvessel mostly proceeds to blur the lines, between creepy and dreamy in Dues to the Dolmen, between shaman chants and Pink Floyd style 70s rock in Unseen Sun, and between weird and early Deep Purple in Your Head is Reeling. Yet at no point Hexvessel forgets to spread a thick layer of psychedelia over it, tubed guitars and meandering keys ruling over cuts like Sacred Marriage. I know it is egotistical of me to have Hexvessel sound like what I would have wanted them to, cleaner and romantic. The band is choosing their own path full in equal measure with that idealistic and dreamy feeling as well as occult and mystical. And choose their own path they should be able to do, I am just meeting them on one side of that proverbial fork in the road.